What Is The Most Suitable Kitchen Layout For Your Home? If you are planning to refurbish your kitchen, one of the things you should consider is its layout. While there are different layouts to choose from, you have to see to it that it suits your requirements. Here are the most common kitchen layouts, and decide which one is the most suitable one for you. Considered as the most common kitchen layout, the L-shaped layout is an excellent choice for medium-sized kitchens. If there is enough space, adding an island or peninsula can create extra storage and function. The smallest of all kitchen layouts, it is the most suitable one for smaller homes or secondary kitchen in larger homes. Because of its size, it is likely to be the least expensive among the layouts. The downside to this layout is that it does not really have a work triangle, so it may not be as efficient as the other layouts. Its name having been derived from the galley of a ship, the galley or corridor layout has all cupboards and appliances in a straight line on opposite walls. Because of its small size, it can be one of the most efficient of the layouts – the things the cook needs is easily accessible to them. Moreover, it is easy to keep it clean. Its disadvantage is that because it is made as a pass through kitchen, it invites traffic into the kitchen, causing things to get crowded. The U-shaped layout is somewhat similar to the L-shaped layout, but it provides more storage and counter space. It is a great choice for larger kitchens. Moreover, adding a kitchen island would enhance the layout. Considered as the modified version of the U-shaped layout, the G-shaped layout is made complete by adding a peninsula. It offers more storage, counter space, and seating space for a few guests. The downside of this layout is that it tends to make the kitchen feel smaller than its actual size. To sum up, there are various kitchen layouts you can choose from: L-shaped, straight or one wall, galley or corridor, U-shaped, and G-shaped. They have their corresponding advantages and disadvantages, so take into certain factors consideration, such as your kitchen’s size and style, before choosing one. Find the most suitable one for you as it is where you will be carrying out the very important task of preparing and cooking food. If you are planning to refurbish your kitchen, one of the things you should consider is its layout. 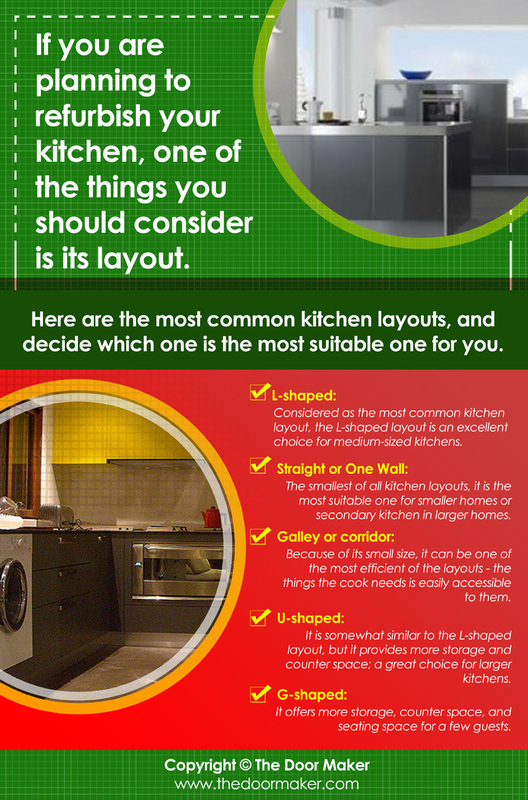 Here are the most common kitchen layouts, and decide which one is the most suitable one for you. L-shaped: Considered as the most common kitchen layout, the L-shaped layout is an excellent choice for medium-sized kitchens. Straight or One Wall: The smallest of all kitchen layouts, it is the most suitable one for smaller homes or secondary kitchen in larger homes. Galley or corridor: Because of its small size, it can be one of the most efficient of the layouts – the things the cook needs is easily accessible to them. U-shaped: It is somewhat similar to the L-shaped layout, but it provides more storage and counter space; a great choice for larger kitchens. G-shaped: It offers more storage, counter space, and seating space for a few guests.